Public art can be seen everywhere these days, from parks to town centres, from hospital settings to overlooking motorways. 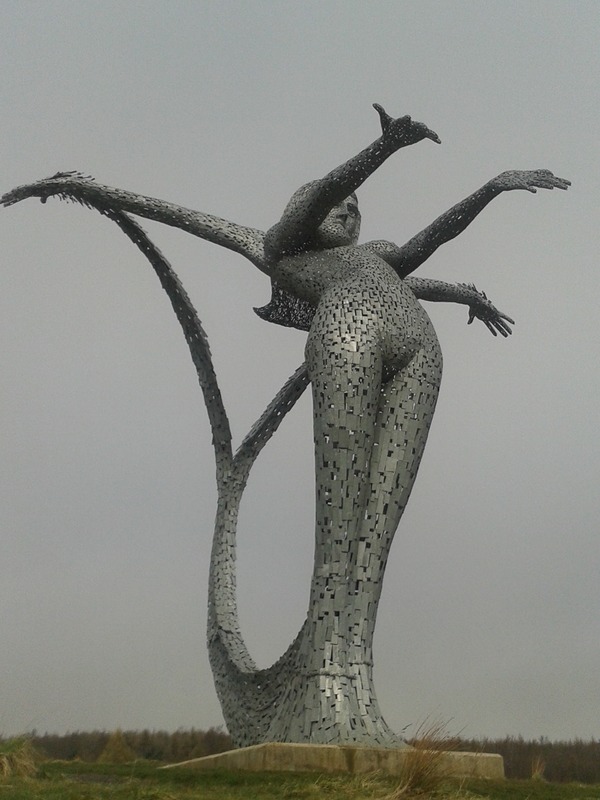 Along with thousands of motorists, on my daily commute I pass one arguably iconic piece by award winning public artist Andy Scott – Arria, dubbed ‘Angel of the Nauld’ as Cumbernauld’s answer to Gateshead’s Angel of the North. It is certainly an eye-catching piece, projecting different images at night when it is lit up by multi-coloured lights. Commissioned as part of a drive to regenerate the area, which had previously won the Scottish Carbuncle award, it was hoped it would “create a sense of place and provide a positive statement about the town”. But can public art really lead to such outcomes? There has been growing recognition in recent years of the contribution that public art can play in improving public spaces and potentially quality of life for residents. A recent survey reveals that “artists, consultants, local authorities and organisations within the health and education sectors largely agreed that public art: played an important role in local, regional and national identity; improved the design of the environment; and performed an important social role”. Nevertheless, with continuing cuts to public spending and increasing scrutiny as to how local authorities spend public funds, it is not unusual to hear people questioning the money spent on art. Although not always well received initially, such as in the case of Anthony Gormley’s Angel of the North, such installations can grow to achieve an iconic status which in turn can have a positive impact on the local community, particularly in terms of identity and belonging, thus arguably improving wellbeing. A recently published thesis from Durham University which uses the Angel of the North as a case study, found that 72% of local residents say the sculpture makes them feel good whenever they see it, and it makes 64% proud of Gateshead. Half of the respondents agreed that it made them feel part of a community. While most respondents said they felt good when they saw the angel, this varied from 61% in a high deprivation area to 80% in a low deprivation area, suggesting that public art alone is not enough. Indeed, a literature review by the Arts Council suggests that public art is most effective as part of a wider programme of regeneration. And our previous blog on street art highlighted its use in the regeneration of urban areas. By using public art to enhance or improve public spaces, the perceptions of such places can undoubtedly be improved. It has been suggested that the use of poetry and text-based art can make public spaces feel safer and deter vandalism, as well as reconnecting a community with its history. Even temporary installations can have a positive impact, by encouraging interaction with the local area. The sculptures of Clyde, the official mascot of the 2014 Commonwealth Games, that were dotted throughout Glasgow during the Games formed the Clyde trail and involved designs by local children. An app was also created so people could follow the trail, hunting down the sculptures. Similarly, the Shaun in the City trail in London has recently been extended due to popular demand. Hundreds of thousands of people have visited the sculptures since they arrived in March, with many a ‘selfie’ having been taken. These sculptures are likely to have an indirect impact on children’s health too, with the London trail raising funds for Wallace & Gromit’s Children’s Charity to support sick children in hospitals throughout the UK. 70 sculptures will then feature in Bristol to raise funds for The Grand Appeal, the Bristol Children’s Hospital Charity. In relation to health more specifically, extensive evidence demonstrating the positive impact art can have has been highlighted. In 2007, A prospectus for arts and health was published by the Arts Council. It includes a summary of research carried out in two hospitals, Middlesbrough General Hospital and the James Cook University Hospital, which compared hospital accommodation before and after the move into a newly developed building (the JCUH). One of the main questions related to the impact of new commissioned art work on users. Among the key findings were that artworks were largely valued for providing colour, distraction and a sense of calm in the public areas, and for some patients they made the hospital seem “less like a hospital”. Surely, at a time when there has been much economic decline, anything that lifts the mood of people, whether it be a huge metal sculpture at the side of a motorway, or a humorously designed sheep, can only be a good thing. The Idox Information Service can give you access to further information on public art and regeneration. To find out more on how to become a member, contact us.